LOBDELL LAKE — This lake covers 545 acres and has a maximum depth of 78 feet. It’s an all-sports lake. Public access is on Seymour Road between Silver Lake Road and Glenn Hatt Street. BENNETT LAKE — A 150-acre all-sports lake, with a maximum depth of 125 feet. No public access, but boating access is available through Lobdell Lake to the north. HOISINGTON LAKE — Encompasses 125 acres, with a maximum depth of 62 feet. Area is largely undeveloped, mostly wetlands. BARNUM LAKE — A 39-acre, 51-foot natural kettle lake. It has a mean depth of 17.9 feet. BUCKBEE LAKE — A 19-acre, natural, spring-fed seepage lake. It has a maximum depth of about 12 feet and an average depth of 5.9 feet. BYRAM LAKE — A 139-acre, spring-fed kettle lake. The lake has a maximum depth of 50 feet and an average depth of 15.9 feet. CRANE LAKE — Also known as Little Mud Lake, it is a 33-acre, natural kettle lake. It has a maximum depth of 35 feet and a mean depth of 12.7 feet. There is a single outlet under Jennings Road. No public access. 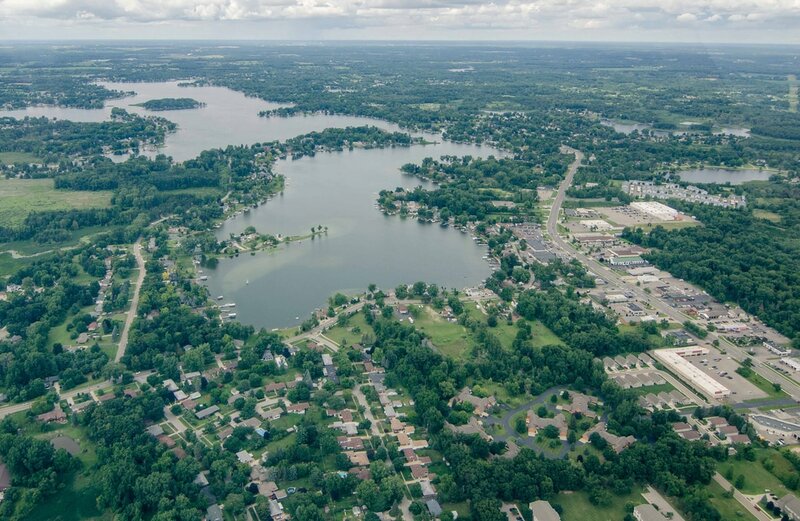 CROOKED LAKE — A very irregular-shaped natural spring-fed, 30-acre lake. Maximum depth is 42 feet, with the average depth being 14.7 feet. It is a hard water lake due to all the springs that lead into it. DOLLAR LAKE — A 46-acre, 27-foot deep natural kettle lake that has an average depth of 12 feet. The lake has a single inlet at the southwest corner and an outlet on the east side. LAKE FENTON — Known as Long Lake in the past, it is an 845-acre, 95-foot deep natural spring-fed kettle lake. It has 18 acres of islands. The lake’s mean depth is 21 feet. LAKE PONEMAH — A 368-acre natural kettle lake. It has a maximum depth of 77 feet and a mean depth of 23 feet. LITTLE LONG LAKE — A 26-acre, 39-foot deep natural seepage kettle lake. It has a mean depth of 11.6 feet. An outlet, located on the south end of the lake, flows through a canal system into Dollar Lake. MARL LAKE — A 75-acre, spring-fed natural kettle lake. It has a maximum depth of 36 feet and a mean depth of 10.8 feet. There is a one-acre island at the north end. McCULLY LAKE — An 11-acre, 52-foot deep spring-fed kettle lake. It has a mean depth of 27.4 feet. PARKER LAKE — Also called Petts Lake, it is a 14-acre, 32-foot deep spring-fed kettle lake. It has a mean depth of 15 feet. SILVER LAKE — Located in Fenton City and Fenton Township, the 310-acre, spring-fed kettle lake has 14 acres of islands. It has a maximum depth of 64 feet and a mean depth of 19 feet. There is a single inlet from Marl Lake on the south end and an outlet that discharges into Lake Ponemah on the north end. There is a 62-foot deep basin at the south end of the lake. SQUAW LAKE — An 80-acre, natural kettle lake with one 2.5-acre island and two deep basins. The basin east of the island is 37 feet deep, and the basin west of the island is 52 feet deep. There is a single inlet from Loon and Crane lakes and an outlet that flows into Lake Ponemah. It has a mean depth of 14 feet. TUPPER LAKE — A 26-acre, river-fed kettle lake. It has a 56-foot maximum depth and a mean depth of 22 feet. The lake is connected to Lake Ponemah and the Shiawassee River. BLAINE LAKE is a 30-acre lake on Hartland Township’s southern border with Brighton. There is no public access. BULLARD LAKE encompasses 43 acres and is a private lake with no public access. 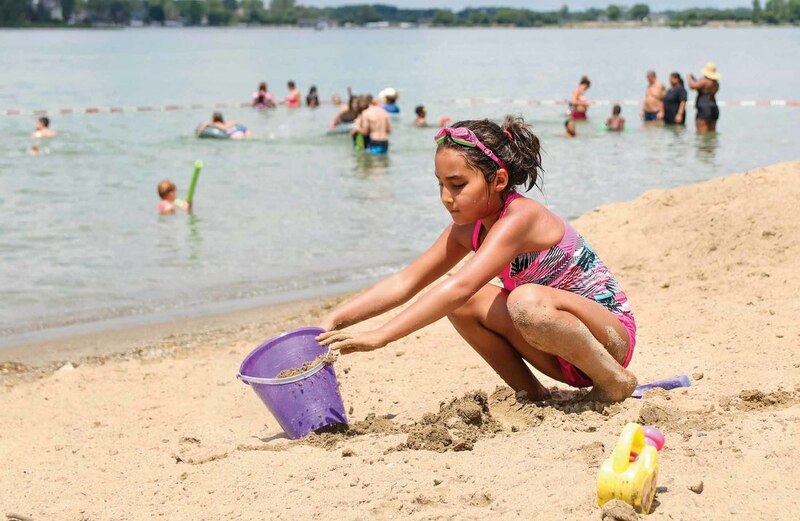 HANDY LAKE covers 57 acres and is one of a four-lake cluster south of M-59 in Hartland. There is no public access. LONG LAKE is a 146-acre lake near Handy Lake, with a maximum depth of 125 feet. It has no public access. MAXFIELD LAKE, west of Long Lake, encompasses 90 acres. There is no public access. PARSHALLVILLE POND is a 51-acre lake created by the dam at the old Parshallville mill on Ore Creek, which is part of the Shiawassee River watershed. ROUND LAKE is part of the Shiawassee River watershed, and encompasses 60 acres. There is no public access. TYRONE LAKE is a 102-acre lake on Hartland’s northern border with Tyrone Township. It has a maxiumum depth of 25 feet. There is no public access. BIG SEVEN LAKE has an access on the west side of the park and DICKINSON LAKE is the access on the north end. Other lakes in the area are: Bush, Crotched, Jewel, McCaslin, Myers, Sand, Seymour (67 acres), Spring, Tyrone and Urbin. CROTCHED LAKE is located north of Grange Hall Road and east of Fagan Road. A boat ramp is at the northern tip of the lake. The lake covers 29 acres. DICKINSON LAKE covers 38 acres. It is located inside Seven Lakes State Park, north of Grange Hall Road. A boat launch site is at the north end of the lake. SEVEN LAKES, located between Fenton and Holly, encompasses the site of Seven Lakes State Park. RUNYAN LAKE — A 160-acre lake with a maximum depth of 70 feet. No public access. The all-sports lake is almost fully developed with year-round homes. LOBDELL LAKE in Argentine Township: The lake is located south of Silver Lake Road and the public access site is on the west side of the lake. Lobdell Lake covers 545 acres. LAKE FENTON in Fenton Township: The lake is situated east of Torrey Road, west of Fenton Road and south of Thompson Road. Boaters may launch their watercrafts at the DNR site off Grove Park Road. Lake Fenton spans 845 acres. LAKE PONEMAH in Fenton Township: The lake is situated north of Silver Lake Road and west of North Road. The public access site is located along the southeastern side of the lake, accessible from North Road. Lake Ponemah spans 368 acres. The start of the Shiawassee River Heritage Water Trail is Water Works Park in Holly, at 690 South Broad St.
*In Fenton, most people launch at Strom Park on South East Street near the East Street Bridge. The park is always open and has no entry fees. There is a small boat launch, a small gazebo, a picnic area, and plenty of fishing. *The Shiawassee River can be accessed from Bush Park, which has two entrances Ñ the east end of Jefferson Street behind St. John's Catholic Church or North LeRoy Street at Fifth Street. Kayaks and canoes can be launched at the DNR public boat launch on Lake Ponemah, accessed from North Road. The Shiawassee River passes through Lake Ponemah and kayakers can paddle across to Tupper Lake where it meets up again with the river. Kayaks and canoes can be launched, taken out near the Linden Mills Building, where public parking is nearby. *The cemetery in Byron, along Water Street, is used as a launch. *There is a place to launch by the ball fields in Byron, west of the river and south of Maple Street. *There is also a launch at the Walnut Hills Campground in Byron. Located at 8100 Grange Hall Road, Holly, both east and west of I-75, between Flint and Pontiac, with 300 acres of lake surface. This park encompasses nearly 8,000 acres. Three lakes: Heron, Valley and Wildwood are used extensively for swimming, boating and fishing, with numerous picnic areas and playground facilities. These lakes are headwaters of Thread Creek, which meanders toward Grand Blanc. They have a natural abundance of large mouth bass and bluegills. Heron Lake boasts walleyes and tiger muskies. Located at 14390 Fish Lake Road, Holly, midway between the City of Fenton and Village of Holly. The land acquired was a combination of farmland, rolling hills and forests. A dam, constructed by developers, formed one large lake from seven small lakes (historically known as the DeCoup Lakes). Big Seven Lake is 170 acres with a boat launch, concession, beach, restrooms and changing rooms. Picnic area with horseshoes, volleyball and playground equipment can be used on a first-come, first-served basis. A large double shelter, which can be rented, is especially popular for family reunions, parties and weddings. Little Seven, Mud, Sand, Spring and Dickinson are the other lakes. Clean and deep, Dickinson is the second largest lake at 44 acres. It has a boat launch and floating pier. A rustic picnic shelter with playground equipment, horseshoe pits, volleyball and a softball diamond. The 70 modern campsite areas opened in 1992. It sits on the edge of Sand Lake. It includes a swimming beach, electricity, toilet facilities with showers and handicapped facilities. Picnic areas, playgrounds, beach area, swimming, fishing and hiking are offered. 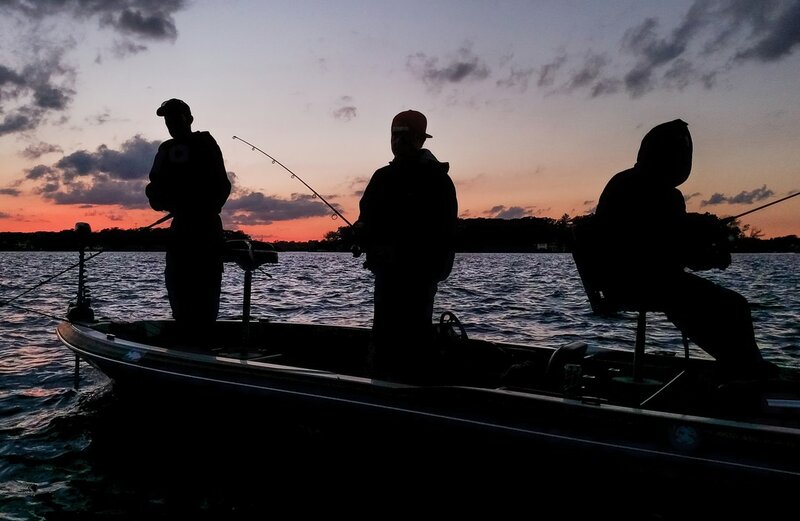 The various lakes have bluegill, bass, pike, tiger muskie and catfish. Hunters can test their skills in the park, where rabbit, deer, grouse and waterfowl provide excellent hunting. The newly introduced Sichuan pheasant and wild turkey populations are adapting and reproducing in this area. The park is accessible from Fish Lake Road. (248) 634-7271.